October 29, 2018 | BY: Steve Edwards and Trevor Thieme, C.S.C.S. October 29, 2018 Steve Edwards and Trevor Thieme, C.S.C.S. It’s one of the questions trainers (and we) hear most from those looking to shape and strengthen their bodies via resistance training. For those of you not interested in details, here’s the short answer: You should always lift the maximum amount of weight that will allow you to complete all of your reps in all of your sets of a given exercise. If you aren’t — by say lifting too light or too heavy a load — you’re shortchanging your results and (worse) possibly setting yourself up for injury. If your trainer gives you a range of repetitions to target for each set — say, 8–12, which most experts consider the “sweet spot” for general fitness and muscle growth — start with a weight that will allow you to barely reach the low end of that range. As you become stronger, you’ll progress to the higher end of that range for the exercise. When that happens, increase your weight by enough to set you back to the low end. Repeat this process for as long as you’re doing that workout. Now let’s take a more detailed look at why this is important and how much it matters, whether your goal is to gain mass, lose weight, or just get strong or ripped. The goal of strength training — whether you’re pumping iron, using your body as your barbell (i.e., bodyweight training), or both — is, of course, to grow stronger. (If you’re looking to lose weight, it’s your best bet for shedding fat, too.) To do that, you need to challenge your muscles. For simplicity’s sake, we’ll define “challenge” as repeatedly contracting and lengthening them under load until they cry for mercy. When you do that, you cause microscopic tears in your muscle fibers. During the repair process, your body not only fixes the damage, but reinforces the fibers with additional contractile units and structural filaments. The result is muscle growth — your muscles literally take on a new and greater dimension, and as they become larger, they have the means to contract with greater force and intensity. Adaptations to your nervous system are what allow your body to exercise those means. The more you challenge your muscles, the better your nervous system becomes at recruiting and activating them. Since neural adaptations occur faster than muscular ones, they are what account for the rapid increases in strength that typically occur at the beginning of workout program. In other words, first you become better at activating the muscle you already have, and as you build more of it, you become adept at activating that as well. So how can you best challenge your muscles? Read on. Most weight training exercises target a certain number of repetitions for each set. This number might stay constant over the course of a workout or change depending on the exercise. Either way, a basic understanding of why this is being asked of you will help you get the most out of your workout program. Time, not numbers, is the actual factor that matters. Or more specifically, time under tension. Repetitions are used as a substitute for time because it’s far easier to count than it is to look at a clock. The load (i.e., the amount of weight you lift) is then scaled accordingly to challenge the muscle. Occasionally trainers will use time but, for the sake of most of our goals, repetitions work well enough. As a general rule, strength gains are achieved in fewer (six or less) reps with higher loads, while muscular endurance improvements are achieved via higher (15 or more) reps with lighter loads. In between (at around eight to 12 reps) is the sweet spot for hypertrophy, also known as muscle growth. 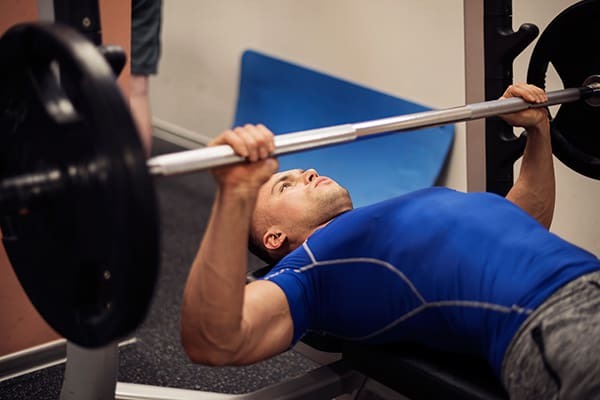 Regardless of how many reps you’re performing, however, your goal is to lift the maximum amount of weight that will allow you to complete not only all of the repetitions in the set, but also all of the sets of the exercise. Hypertrophy is what most workouts target because it’s the quickest means of changing your ratio of muscle to fat. 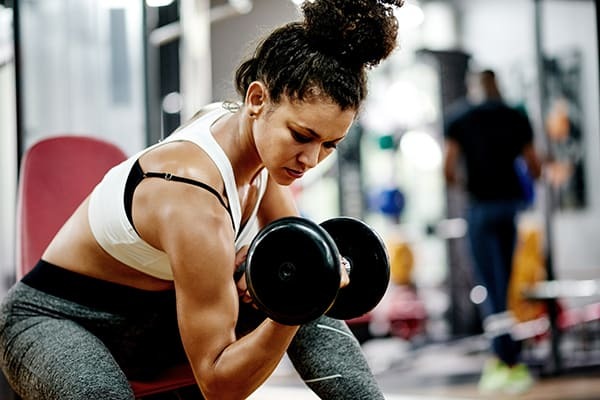 Whether your goal is to lose or to gain weight, beginning your workout program focused on hypertrophy changes your metabolism, which is the main objective in body transformation. Once your metabolism gets moving, how you then structure your diet and exercise will determine whether you gain or lose weight, and how quickly that change occurs. What this means is that even if your goal is to lose weight, you should push hypertrophy workouts as hard as you can. Never take it easy, especially using the (much too common) rationale that “I don’t want to gain too much muscle — I just want to lose fat.” Adding muscle accelerates fat loss, which is where the saying “muscle burns fat” comes from. Furthermore, gaining bulk is a very difficult thing to do. Some people, especially women, tend to overthink this issue. Most bodybuilders would sell their soul for a few additional inches of muscle mass, so nothing frustrates them more than to hear others suggest that it can happen by accident. And if you’re a woman, it’s likely not something you have to worry about anyway. Generally speaking, women can’t “bulk up” as much as men. It’s a genetic thing. And the only way to override it is with steroids. Focusing on strength or hypertrophy will target your type II muscle fibers, which are the larger and stronger of the two kinds found in your body. Type II fibers also have the greatest growth potential. You also have type I fibers, which aren’t as powerful as type II fibers, but have a higher resistance to fatigue. If you’re a distance runner or a cyclist, these are the fibers upon which you rely. And if you’re a weightlifter, these are the fibers you probably ignore, and you likely do so for for several reasons. First and foremost, you probably believe targeting them is a waste of time. You’re focus is strength after all, so why would you nurture the same endurance-oriented fibers as a marathoner? But more important, you’ve likely also been told that they have no growth potential — a belief that research is proving false. Although not as great as type II fibers, type I fibers still have “a substantial propensity for hypertrophy,” according to a study in the Strength and Conditioning Journal. And if you want to maximize muscle growth, you can’t ignore them. So what does all of this mean? Simply this: While the most effective body transformation programs focus on hypertrophy, they don’t ignore endurance. In practice, that means not focusing solely on one set/rep scheme, but including a range of repetitions (low, medium, and high) in your workouts. You might hear some trainers say, “Failure is not an option, it’s the only option,” meaning that if you aren’t lifting enough to fail on (i.e., not complete) the last rep of your last set of a given exercise, you’re not lifting enough. Ignore that advice. Lifting to “absolute failure” (as it’s known) almost guarantees your form will fall apart during the last couple of reps. That increases your risk of injury. What’s more, there’s little evidence that struggling through one or two final, sloppy reps will produce any additional growth stimulus that makes that risk worth it. Here’s a better plan: Lift to “technical failure” — the point at which your form begins to deteriorate. Not only will you reduce your risk of injury, but you’ll recover faster. And the faster you can recover, the faster you can progress toward your goal.